**TRIPADVISOR 2014 CERTIFICATE OF EXCELLENCE WINNER** Providing premium accommodation, with stunning sea views from every room, this designer bach is located in Oneroa in a 'tucked away but central' location. Set on 3 levels with quality furnishings throughout: the entry level is the foyer and bathroom, then walk down a short flight of stairs to the living, dining and kitchen. Up one level from the entry is the very spacious bedroom, where you can lie in bed whilst gazing out at the magnificent sea views. Bedroom - Super king bed with luxury linen provided, bedside tables with lighting, fan, wardrobe, reading chair. Living/Dining/Kitchen - open plan living, dining and kitchen which opens via wall length bi-fold doors onto a large deck. From coffee plungers to candles, the house is fully furnished for your every need. Free Wifi internet and Netflix on demand movies and tv shows. A huge southwest facing deck provides stunning ocean views and landscaped gardens, incl Mountain Bikes, Gas BBQ, sun loungers, quality aluminium/glass outdoor furniture. There is also private, off street parking, should you have a car. Beaches - Surfdale (just a few min walk down a bush track directly off property). Blackpool and Little Oneroa (15 min walks). Oneroa (approx 20 min walk or 2 min drive). Shops, Cafes, Bars and Restaurants: Oneroa Village (3 min drive). Surfdale village (a few min walk). Countdown Supermarket just a 7 min drive. Beautiful Cable Bay and Mudbrick vineyards are approx 5 min drives. Passenger/Car Ferries (Matiatia Wharf/Kennedy Point) just approx 6 min drive away. Bus stop 10 min walk. A $70 linen/cleaning charge will apply to all stays, however a change of linen during your stay is NOT included in this. If you require a change of linen mid-stay (e.g. for longer stays), this must be requested in advance and an additional charge will apply. Smoking not permitted inside property. No pets allowed. 3 night min stay during High Peak Period (20 Dec to 15 Jan) and Bank Holidays. 2 night min stay all other times (however 1 night stays may be allowed-subject to a surcharge). 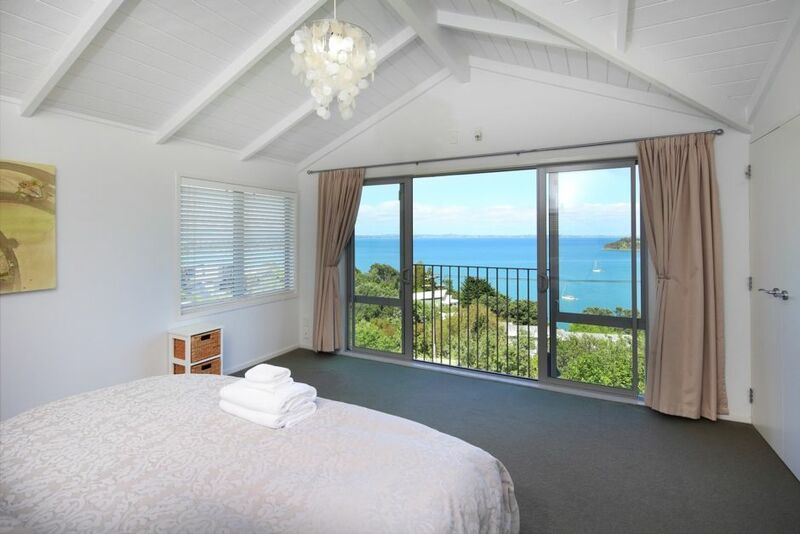 We will definitely recommend this home to friends and family, all we need to say is the bed has the best view ever!!!!! Thanks so much Jenny! We are totally thrilled you loved everything ! Thanks for spreading the word about our little piece of paradise. Nice and quiet area, great views and everything we needed available. Nice and quiet area, great views and everything we needed available. Would stay here again. Needed vehicle as indicated which we hired. Pleasant place to stay. What a beautiful location. Almost everything is 5-10 minutes drive away. The view from the main bedroom is breath-taking. I would definitely recommend this property for a special romantic getaway. Unfortunately, with our luck the weather was not the best on Waiheke during our stay so we could not appreciate the full potential of the property but our it was very pleasant regardless. I would definitely stay again (hopefully during better weather) and recommend this to my family and friends. Thanks so much for your superb review. Thanks for recommending us on too. We love to think that The Point offers the FULL experience for our guests and it sounds like you had that. Lovely spot, beautiful views. House was private and cosy. Lovely linen, very clean & tidy. Thank you for having us stay in your lovely Bach. Fantastic little house with great sea views over Surf dale. This was an absolutely lovely little cottage for two! Thanks and you are welcome! We try to provide everything you need for a full, self-catered holiday. We're really glad you found that to be the case.